There were some facts disappeared from yesterday's Star Advertiser story on the City's raid on deOccupy Honolulu — the 57th by my list but I may be missing some — but you really can't blame them. Star Advertiser photographer Dennis Oda showed up for part of the raid, and the bylined "Star Advertiser Staff" is a euphemism for cut and paste from the City's press release. I was there for the entire raid and live streamed video and photographed the whole thing. There were a couple of authentic firsts at what would otherwise have been a routine raid. I don't know if this is part of the new Caldwell administration policy or what, but the "crime tape" that cordons off the exclusion zone required by the Federal court agreement now carries advertising. On tent:"I am a tent. Often I am used for camping, sleepovers, or housing. Today I am the face of the houseless and a movement fighting for social and economic justice. I am a sign. I am art. I am a message." On new Honolulu Police Department crime tape advertisement: "Countdown Sales Event, up to $1000 off selected models / See Suzuki Dealer for Details / 0% APR for 5 years"
While corporate sponsorship of raids on the homeless is certainly consistent with the Occupy Movement's world view, I can't see why anyone would want to be associated with these actions or may imagine that this kind of advertising is effective. There are better public service announcements that can be used instead of this sort of advertising. I'll be tracking down how organizations can take advantage of this new opportunity if it is indeed a new program, so stay tuned. Under the Carlisle administration, the raids were conducted by Westley Chun, the Director of the Department of Facility Maintenance, a cabinet position. The new Director, Ross Sasamura was watching from the sidelines as Deputy Director Ken Shimizu — an old hand at this by now — actually led the raid (see the Flickr photo set). While Sasamura dodged my questions with a "no comment," deOccupier Chris Smith (and Makiki Neighborhood Board member) was more successful in engaging him in an actual discussion, the first such dialog after more than a year of adversary action by the City on the group. The last half of this edited video of the raid features part of the discussion between the two. Perhaps these discussions will continue without the armed personnel or heavy equipment and their associated costs to tax payers? TOO GOOD, Doug... & good laugh about something not so funny. I wish the deOccupiers would occupy our US senators' & reps local offices... at the park I have a feeling it just turns off people in the neighborhood or those driving by, which is not helpful to the cause. "I have a feeling it just turns off people in the neighborhood or those driving by, which is not helpful to the cause." Much agreed! I work in Downtown and have been passing this "homeless/occupy something" camp since the start and it's quite the eye sore. I don't even know what you guys are protesting for already. Seems like everything under the sun except the original cause. What's wrong with the state capital grounds? Honestly, it would make more of a statement there instead of the park. Being at the park, others are just like "more homeless" messing up another once beautiful park. I hear what youʻre saying. At the same time, itʻs been difficult -- impossible really -- for the group to maintain signage after almost 60 raids. Literally hundreds of signs have been seized by the City. It is definitely a tactic of depriving them of an identity and a voice. 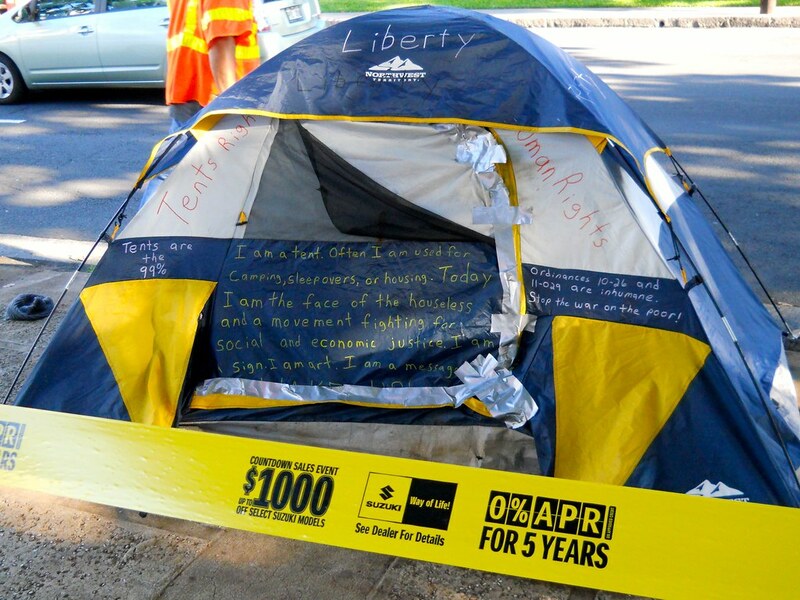 deOccupy Honolulu did stage a 10-day popup encampment at the State Capitol last year, and that was while maintaining one at Thomas Square too. Now I've seen everything. There won't be anything left to surprise me anymore.